Earn Bitcoin, Ethereum and Storm by playing Games on your Mobile! There are so many of these faucets out there whee they claim to reward you in crypto by completing the task, watching ads or playing games. If you have investigated ways to earn any type of cryptocurrency, you will be all too familiar with these types of apps that prove more trouble than its worth. "Watch ads and earn ten satoshis" or "Press this button and earn some Ethereum!" If you were a robot, those would work out fine, but if you are a sensible person, you will soon come to realise that you are basically going down a dead end! Good news for all crypto fanatics, we finally found a great app that does not waste your time and rewards you with a decent amount of currency for your efforts! What's even more exciting is that you can swop your rewards for 1 of 3 types of cryptocurrencies, Bitcoin, Ethereum or Storm Token. 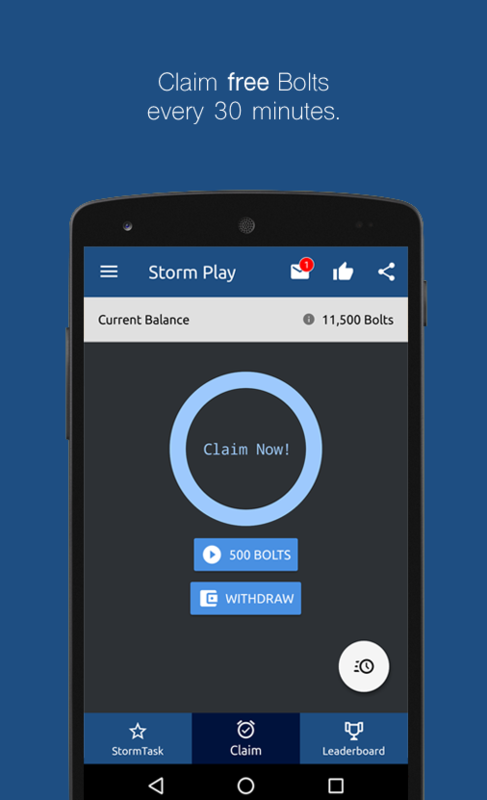 Storm play is an android based app which adds a fun and easy way to earn free cryptocurrency! Based on a gamified micro-task rewards system you can easily receive free STORM Tokens, Bitcoin, and Ethereum for trying out new games, products, and services. Tasks are pretty exciting and usually involve completing goals on games you have to download. These are typically long-term strategy games, some of which I am still playing long after I have completed the required tasks. Low rewards tasks: Watch a short video every 30 minutes and receive 500 bolts. 90% of the time you don't even have to watch the entire video, they usually only a few seconds long. High rewards tasks: Download and use apps, mostly games, and complete goals specified by the Storm. With these tasks, you can earn anything from 50 0000 bolts to 400 000 bolts. It really depends on how much effort the tasks require. Use the Referal Code: Z35AMH and receive 6000 BOLTS FREE! FYI: This referral system does not work like a Ponzi scheme so don't rely too much on this feature. In order to benefits from this system, you will have to constantly recruit new users! Bitcoin: Coinbase and Xappo wallets are compatible. Ethereum: Coinbase is the only exchange wallet that is currently compatible. STROM: Jaxx is the recommended wallet for this crypto. Which platforms are compatible with STORM Play? 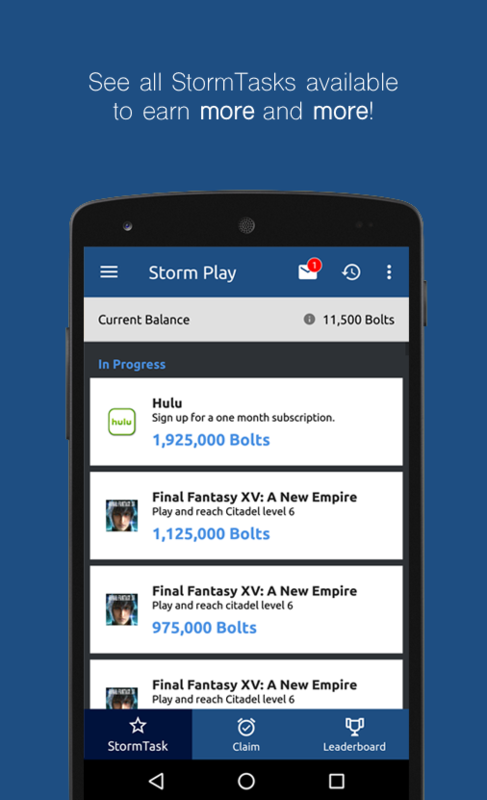 Always make sure you download the app via the storm play app. If you download directly from the play store or have previously installed the app, you will not receive your rewards. After completing tasks, it may take some time to receive your reward. Usually ist instant, but there have been times when I received my rewards two weeks later. You can also escalate this matter if more than 24 hours pass and you still have not received your bolts. Some ads an exit or skip add button appears after 4 seconds, if you click it you will still receive your rewards. Be sure to complete the CAPTCHA after watching an add otherwise you will not receive your reward. The clock only resets after this is completed. If you want to know more about cryptocurrency don’t be shy we’re happy to assist. Simply contact us.